The comeback of the Eggstraordinary Dippy Egg! After its successful launch last year, we are happy to announce that the show-stopping Heston from Waitrose egg is back. This truly Extraordinary Egg hit Waitrose shelves a couple of weeks ago and is sure to be a talking point again this Easter, as friends and family gather round to dig into it . With its light brown speckled shell, it looks just like a real, extra-large hen egg. 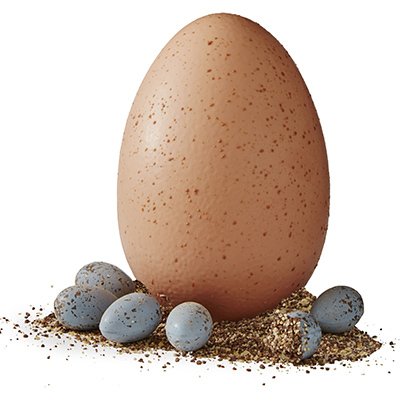 Once the shell is cracked open, it reveals a nest of mini eggs which resemble British blue bird eggs, complete with a soft salted caramel centre . An edible soil of caramelised cocoa nibs, freeze dried passion fruit and creamy white chocolate flakes is the perfect accompaniment for the rich chocolate. Bite the end off a caramel egg and dip into the edible soil for the ultimate eating experience. Following on from the great success of the Extraordinary Dippy Egg launch last year, we are excited to release our first ever Easter chocolate box – although this is of course no ordinary box, but a Speckled Eggs chocolate box. While doing research for the mini eggs inside the Dippy Egg, we were struck by the beauty and variety of British bird eggs and decided to feature one in our chocolate box. 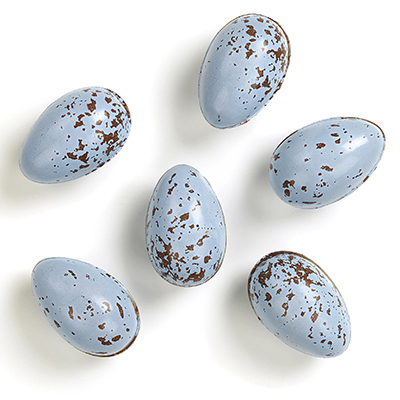 And so these soft-salted, caramel-filled, chocolate eggs are teal with dark spots – exactly like Song Thrush eggs.